Anton Virane is a Breton citizen living in Markarth. 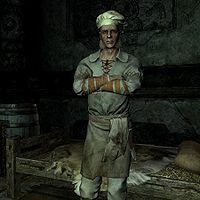 He was born in Daggerfall in High Rock, which is where he learned to cook. He is the master chef working in Understone Keep with his two assistants Rondach and Voada, although he considers them both to be worthless. He is often assumed to be a native of the Reach, an accusation which he finds offensive. He is also a close friend of Balagog gro-Nolob. Anton wears a chef's tunic along with a chef's hat and a pair of shoes. He wields an iron dagger and carries a selection of common loot and gold. When you approach him for the first time, Anton will make it clear to you that he is not a native of the Reach: "Before you say anything, no, I am not from the Reach." He will then begin to talk to you about his heavy work load: "I have meals to cook for the entire castle and almost no help." He will elaborate on this, stating that his two assistants are less than helpful: "The Jarl gives me two incompetent assistants. Worthless." You can ask him if he is not from the Reach, to which he will give a very passionate response: "No. I'm a Breton from High Rock, and I refuse to be mistaken for a filthy native. I don't care if we share the same ancestors, these people are savages. Half of them are Forsworn barbarians, and have you seen what they eat? What have I done for the gods to take me so far from my beloved Daggerfall?" You can then ask him to elaborate on the fact that he is from Daggerfall, to which he will gladly reminisce about his homeland: "Yes. The finest court in all of High Rock. You think politics here are something? Well, we Bretons invented politics. That is where I learned to cook, and where I belong. Not here, with all these dogs." Anton: "Voada, you spilled laundry water in the soup pot again! Do I need to cut off your fingers to teach you a lesson?" Rondach: "You touch her, and I swear it'll be your fingers that go missing, you stupid Breton!" Voada: "Now now, brother. Arnoit [sic] is just being his usual gloomy self, he didn't mean it, did you Arnoit [sic]? You're just being silly again." Anton: "Whatever. Just get back to work. Now." Anton: "Filthy natives. Get to work. We have meals to prepare and no time to prepare them!" Rondach: "Always another big meal to cook. Figures." Anton: "Move it. Get to work. Get to work!" This page was last modified on 18 October 2018, at 07:10.